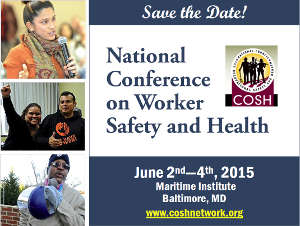 Mark your calendars for June 2nd-4th, 2015, the dates for the National COSH Conference on Worker Safety and Health. We’ll be at the Maritime Institute in Linthecum Heights, just outside Baltimore, Maryland. Check out the “Save-the-Date” flyer on our website, easy to download and share, and please circulate to friends and colleagues. "National COSH is the organization that brings all the groups doing worker health and safety work together in one place, at one time,” says Robert Shull, Workers Rights Program Officer for the Public Welfare Foundation. “If you're working on these critical issues, you don't want to miss this event." Every year, hundreds of participants – from unions, worker centers, advocacy groups, family support groups, COSH organizations and others – gather for workshops, speakers, and networking. The goal: to sharpen our advocacy and training and education skills so we can better assist workers who are standing up for safety on the job. It’s an exciting event, a great chance to see friends and colleagues and a fabulous learning and sharing experience. See you in June! Your suggestions for the National Conference on Worker Safety and Health are welcome. If you would like to propose facilitating a workshop, please email by December 31.